Application: Perfecto! Went on smoothly and flawlessly. It took two coats for Princess Sabra to be opaque. Though I love the design of the bottle for A England, the brush was a little less sturdy than I am used to. Also, the brush is very thin, though it worked with little issue. The quality may have been compromised on the actual brush to cut down on production costs, but I can say that the polish itself is great quality, so fear not! In fact, the polish itself lasted a good 6 days with little wear. 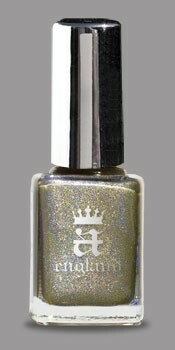 The Color: Princess Sabra is a light, olive, bronze holo polish. Bronze and olive are two colors that don’t normally go with my cool skin tone, but Princess Sabra looked great on my digits if I do say so myself, making me believe it would work for many skin tones. The Verdict: Love! Yep, that’s right, I love this polish! I can see myself wearing it often as I kept staring at my fingers admiring the unique color during the whole 6 days I wore it. Though Princess Sabra is a holo, be warned that the effect is slight and not as strong as some holos on the market. This did not bother me in the slightest as I don’t discriminate when it comes to holos. But even with a more subdued holo effect this is one fabulous color that will be a stand out in any collection. Because these polishes are available through A England’s site which is stationed in England, the price is a little more hefty than most polish due to the conversion rate of the Pound vs The USD. But if you are used to higher end prices for Butter London, Chanel, Dior, etc. and don’t mind the steeper price, you will not be disappointed. Trust me! I can’t wait to try the rest of the four I received! Thank you dear friend!